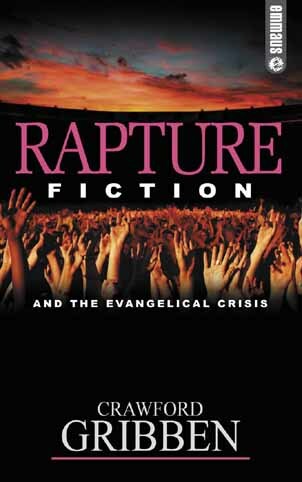 Gribben continues his look at popular “rapture fiction” in chapter 3 titled, “The Origins of Rapture Fiction.” In this fascinating chapter, Gribben introduces us to the genre of rapture fiction and traces its themes, placing the current bestseller phenomenon of the Left Behind series and its derivatives, in the same stream. Gribben here begins to hint at the doctrinal weakness of the Gospel in this modern rapture fiction. Gribben begins by reminding us of the popular Hal Lindsey and his modern dispensational interpretative scheme by interpreting prophecies not literally, but with a modern touch. Locusts become helicopters. Riders on horseback with swords become tanks. This is the Dispensationalism that most people are familiar with. It is the sensational Dispensationalism of the Bible in one hand and the newspaper in the other. Unfortunately, this is the worst form of Dispensationalism not taken by the movement’s best scholars. I remember myself sitting in a class in seminary on the Book of Revelation with the professor saying, “yes, if the Bible said the blood rises to the bridle of the horse, then that is what happens!” He never thought for a second these horses were tanks! Gribben reminds us that Lindsey did not begin the popular dispensational approach. He introduces us to Sydney Watson who did not originate the genre but was perhaps the most popular of early rapture fiction writers. Gribben shows us the themes of Watson’s work. The main idea is simply the world is falling deeper and deeper into immorality (a hallmark of Premillennial eschatology) and that the only solution for problems like urbanization, and the growing ecumenical movement and higher criticism in the church. These themes continue in modern rapture fiction. Things have had to be adjusted over time (for example the fall of the USSR and the end of the cold war forced writers to no longer view Russia as the apocalyptic enemy but rogue states joined together in a new world order) but the idea that the faithless are left behind remains the same. “The novel’s presentation of Catholicism has often been criticized, but observers have consistently failed to appreciate the watershed in evangelical opinion that these novels represent. Historically, evangelical exegetes have either identified the Pope as the Antichrist or have predicted that Roman Catholicism would be central in the end-times persecution of true believers. Left Behind challenges these assumptions, echoing a major re-thinking of evangelical attitudes to Catholicism” (p. 52). Gribben traces other strange developments in the spin-offs of the Left Behind series. For instance, there is question about Mel Odom’s Apocalypse Dawn where either he advocates a partial rapture or that people can lose their salvation. Either of these are theological changes from what modern Dispensationalism would adhere. Gribben in concluding this chapter is right to note that the modern rapture fiction’s focus is on developing an empire. With spin offs in movies, toys, etc., it is clear that disaster fiction always sells whether it is secular or Christian. Even worse than this, Gribben notes that these books sell because “evangelicals have lost the capacity to judge whether the novels’ theological presuppositions are actually true” (p. 61). Gribben’s survey of the rapture fiction genre is excellent. It places the modern rapture fiction in the older stream of the genre but shows some disturbing new theological changes. Modern rapture fiction is not representative of what mainstream Dispensationalism believes. Gribben is right on when simply he says evangelicals will buy anything and cannot discern right from wrong any longer when it comes to theological truth. For instance, the believe that the Pope is raptured amongst the faithful is difficult to swallow based on Roman Catholicism’s inherent opposition to the freedom of faith alone in Jesus Christ. I am anxious to continue reading and interacting with this fascinating book. While I continue to adhere to a form of Dispensationalism I am horrified by Gribben’s revelations of the core theological problems related to the nature of the Gospel in these books. I continue to encourage all evangelical pastors and laymen to carefully read this book as a helpful treatment for the error of modern rapture fiction. This entry was posted on Sunday, March 4th, 2007 at 4:18 am and is filed under Book Series, Eschatology, Rapture Fiction. You can follow any responses to this entry through the RSS 2.0 feed. You can leave a response, or trackback from your own site.